This week is Sugar Awareness Week so I thought it only apt to write about my experiences in my clinic with battling the white stuff. As I often say to patients the reason why it’s so hard to keep within government guidelines is because of the hidden sugar in our food; at least you know what you’re getting with a Haribo or a Coke. It’s the often so called ‘healthy’ foods, including the savoury ones, that are laced with sugar that surreptitiously push us over the safe limit. We all know that the over consumption of sugar is not good for us. The stats are clear. The increase in sugar consumption over the past 30 years has paralleled the increase in obesity, diabetes and heart disease; the UK is one of the most obese nations in the world with about a quarter of adults classed as obese (and sadly that figure is predicted to double by 2050); a third of primary school leavers are already overweight (NHS Information Centre for Health and Social Care, 2012). This article however, is not about the toxic effects of sugar or the future burden it’s likely to place on the NHS; it’s about how easy it is to feed our children too much sugar, over the government’s Guideline Daily Amount (GDA) of 85g sugar a day for 5-10 year olds (there is no GDA for 11-16 year olds or for the under 5s). Sugar RDAs past 11, surprisingly jumps to the same as an adult man (120g) or a woman (90g). The effect of sugar on a child’s behaviour is well documented. Sugar in the form of glucose is the only fuel the brain can use. However, the brain doesn’t function well if it gets fed too much sugar, as a sugar high often leads to a low. High sugar foods encourage ‘blood sugar rollercoasters’. Sugar highs can exacerbate ADHD in children, a lack of concentration with an inability to sit still or listen in class and the proceeding sugar low can also cause these symptoms, along with irritability and aggressive behaviour. So lets focus on breakfast – in my opinion the most important meal of the day and one which has the greatest effect on how we eat throughout the rest of the day. High sugar at breakfast creates these blood sugar highs and lows for the rest for the day. Cereal manufacturers use clever marketing tactics when it comes to talking about sugar content. Kelloggs ‘Lets put Sugar into Perspective’ section on their website states that sugar is ‘within guidelines, an important part of a balanced diet’. I think the ‘within guidelines’ is key here – do Kelloggs really believe they are working within those guidelines when producing cereals with 37% sugar? Kelloggs use statistics very cleverly to get across nutritional half-truths. They state that a 30g bowl of Frosties has less sugar than a banana, well it does (30g bowl Frosties 11g, a small banana 12.35g) but a banana contains fibre (2.1g), which slows down the release of sugar into the blood (along with benefiting other parts of the digestive system), whereas Frosties contains 0.6g fibre; so the sugar is broken down very quickly (with no benefits to the digestive system). It’s also interesting to note that the small banana is 101g. 101g equivalent of Frosties would contain 37g sugar…. Thankfully, Kelloggs have recently been banned from using the Frosties’ advertising slogan “They’re grrrreeeeeat!” because, well basically, they’re not. However, Kelloggs are still allowed to produce food that is 37% sugar for breakfast! As mentioned above, a 30g bowl contains 11g sugar. Have you seen how small a 30g bowl of cereal is (one of those variety packets)? It’s unlikely that a child would consume such as small portion. Also take care when reading the cereal packet’s nutritional information. Frosties for example, states a 30g bowl is 11% of GDA sugar. The nutritional label uses adult GDAs to make the percentages seem less; it would be 13% verses child (5-10 year old) GDA guidelines. Sticking with breakfast for a moment, fruit juice is another contender for my high hidden sugar stakes. Innocent smoothie (recently bought by CocaCola)– is marketed with a halo and marketing speak such as “…we’re here to make it easy for people to do themselves some good (whilst making it taste nice too).” A 150ml of Innocent Orange and Mango juice has almost the same amount of sugar in it ml for ml (15.8g) as a Coke (15.9g). Interestingly, Kelloggs have recently reduced the sugar in Coco Pops by 30% from 30% to 17% (I wonder if this was in order to be allowed to market again on TV although they have still been banned). So if even if your child opts for a bowl of lower sugar Coco Pops and probably more like a 50g size, then already, with 100ml skimmed milk, they are consuming 14.5g sugar, equating to 17% of their daily allowance. Add to that a 150ml glass of fruit juice (Innocent Orange and Mango: 15.8g sugar) they are well on the way to consuming over a third of their GDA sugar intake in one meal. Add to that an Actimel (“The little bottle with a lot inside” – yeah, 11.6g sugar!) and that takes the grand breakfast total to 41.9g. 50% of their RDA before 9am…. Watch out for other high hidden sugar foods. A 100g petit filous yogurt pot contains a whopping 12.2g, small raisin packets contain a whopping 10g sugar (2.5 sugar lumps). Innocent kids smoothie small carton (Oranges, Mangos and Pineapples, 180ml) has 20g sugar, 24% of children’s GDA – credit to them though, at least they state this figure verses children’s GDA on their website. The smoothie is classified as one of your five a day…but a 100g orange (8.5g) plus 40g mango (5.5g) plus 40g pineapple (3.9g) equates to 17.9g and would equate to 4 of your five a day. It’s much easier to consume more sugar through juices than eating whole fruit! So what can we do? Try making your own granola using honey as the sweetener or opting for low sugar cereals such as: Lizi’s no added sugar granola (3.8% sugar) rice crispies (10% sugar), corn flakes (8%), Oatabix (3.2%) or good old porridge with a little honey. Mix up their usual cereal with lower sugar options to reduce sugar content, get them used to drinking water at meal times at home, limit fruit intake to 2 pieces a day and try not to give a dessert after lunch to help lessen their sweet tooth. 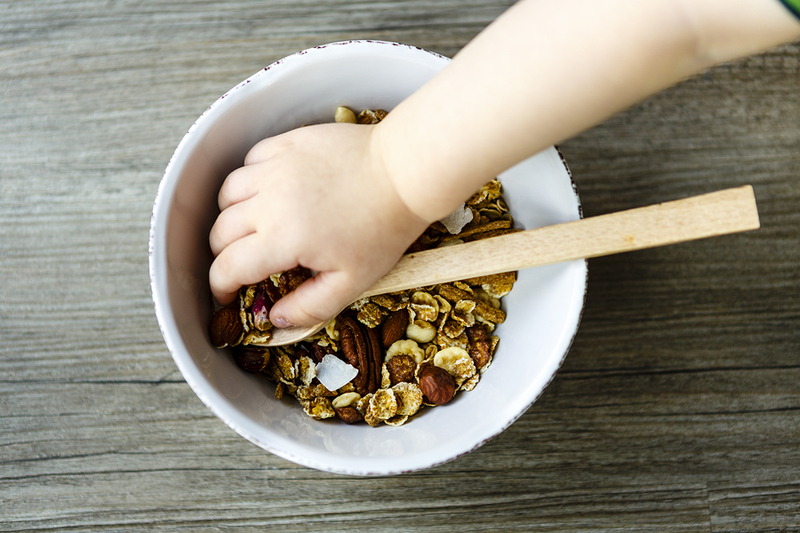 Try more protein rich breakfasts to help sustain energy throughout their busy mornings at school such as a eggs, sardines on toast, avocado and eggs on toast, nut nutter (if tolerated) on toast, Lizi’s no added sugar granola with coconut or almond yogurt and berries or porridge with a sprinkling of ground nuts and seeds mixed in. I really don’t have a problem with a little of the white stuff – I think the more you stop your children from having it, the more they crave it. I generally go by the 80/20 rule – if they are getting enough nutritious foods, then their body has a better chance of processing it. The problem is being aware of those hidden sugar products; because I think it’s fair to conclude that children really are sweet enough!